The church, placed on the end of a large courtyard surrounded by a portico, from the first half of the fifteenth century and is built in late Gothic style. In the place where the church stands today there was a pagan shrine with a source that in the Etruscan-Roman period was dedicated to Apollo, while in the Middle Ages was called Source Tecta. In 1425, San Bernardino of Siena tried unsuccessfully to destroy it. Chased out of town, he returned there in 1428 but managed this time in the purpose and by building instead of a source an oratory, where between 1428 and 1431, Parri Spinello painted the fresco with the image of Our Lady of Mercy, today inserted marble in the altar by Andrea della Robbia (1487-1493). 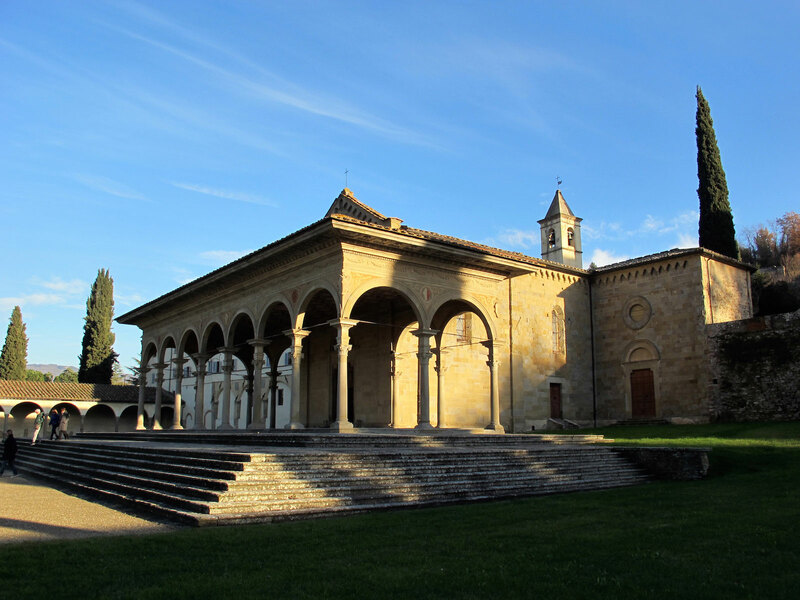 On the end of the fifteenth century, Benedetto da Majano erected the outside staircase and the porch in front of the church, a first Renaissance masterpiece of lightness and grace, which inspired Brunelleschi’s Ospedale degli Innocenti.